Satisfy your appetite for lunch or dinner at the guesthouse's restaurant, or stay in and take advantage of the 24-hour room service. Relax with a refreshing drink from the poolside bar or one of the 3 bars/lounges. A complimentary local cuisine breakfast is served daily from 8:30 AM to 11:00 AM. 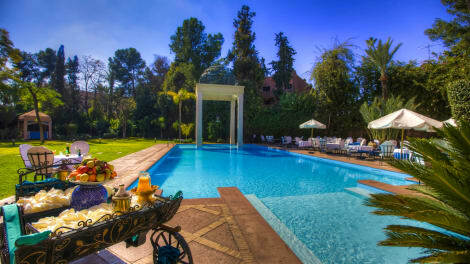 Sitting in 4 hectares of private, landscaped grounds, the traditionally Moroccan 4-star Hotel Marrakech Le Semiramis is a particularly relaxing place to stay. The Medina, the heart of the old town, is just a short drive away, but you'll find everything you need on-site, including tennis courts, a pool, fully-equipped gym, spa, bar and two restaurants. Your air-conditioned room is a great place to unwind, furnished with a HDTV, private bathroom and balcony. breakfast free for children until 6 , extra charge for breakfast for children between 7 and 12 = 30 DHS per child , extra charge for dinner for children between 4 and 12 ans = 75 DHS per child per dinner. A beautiful 4-star hotel in Marrakech, the Tichka is characterised by its grand décor, sweeping ceilings and extravagant features. A short drive from the centre of Marrakech, this hotel is within easy reach of the cultural hotspots, bars and restaurants. On site, there’s everything you will need for a relaxing, sun-filled stay, including a gorgeous pool, a restaurant and elegant guest rooms complete with sumptuous touches and floor to ceiling windows.extra charge for children between 7 and 12 breakfast : 30 DHS per child , extra charge for children between 4 and 12 dinner : 75 DHS per child per dinner. 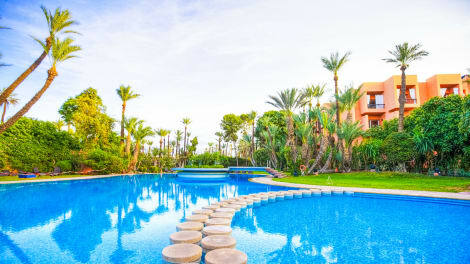 The 4-star Hotel Ayoub & Spa is found in the north of Marrakech, close to the famous Jardin Majorelle botanical garden. The hotel has a year-round outdoor pool and spa centre, sun terrace and hot tub, free parking facilities, 24-hour reception, lounge, restaurant and bar. Each room is air conditioned and has a flat-screen TV, private bathroom and free wi-fi. With a stay at Hotel Mont Gueliz, you'll be centrally located in Marrakech, within a 10-minute drive of Palais des Congres and Menara Mall. 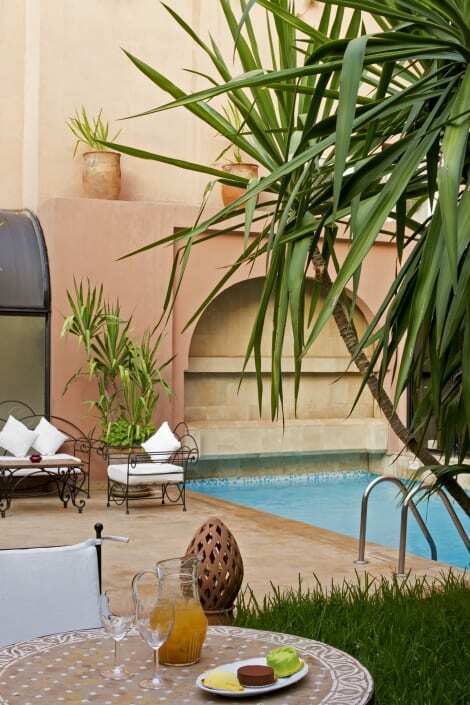 This 4-star hotel is 2 mi (3.2 km) from Jemaa el-Fnaa and 3 mi (4.9 km) from Menara Gardens. Nassim Hotel is located in the center of Marrakech on Boulevard Mohamed V in the neighborhood of gueliz, one of the most touristical area of the city, less than 5 minutes from the famous Djemaa el Fna square and also: 10 minutes from Marrakech Menara Airport, 5 minutes from Majorelle Gardens, 5 minutes from Menara, 3 minutes from the station, 10 minutes from the nearest golf course, 5 minutes from Royal Tennis Club, Adjacent to the delegation of tourism, Attached to the bus stations and tourist taxis and 2 minutes from La Poste and his famous coffee. extra charge for Children between 6 and 12 = 20€ for extra bed. extra charge for breakfast : 6€ per person. The contemporary 4-star Diwane Hotel & Spa Marrakech is situated in the heart of Marrakesh, just a 10-minute drive from Jaam El Fenaa Square. 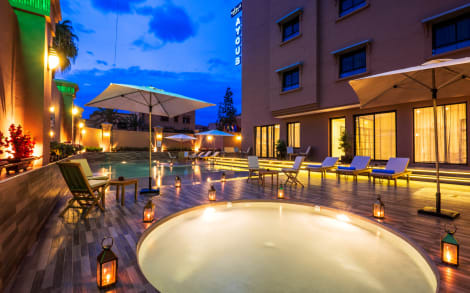 Its facilities include an outdoor swimming pool, a fitness centre, a spa, and a restaurant serving Moroccan and international cuisine. The smartly decorated rooms feature flat-screen TVs and private bathrooms.